It was the autumn of 1985 when I walked down an aisle in the book store of the University of Calgary, and one particular book cover caught my eye. In fact, the cover of The Summer Tree, by Guy Gavriel Kay, didn’t merely catch my eye, but I felt like it snagged my whole soul as I came to a dead halt and grabbed the book off the shelf. With my reading of the three books, which comprised the trilogy called The Fionavar Tapestry, the only way I could describe how they made me feel was to say that I felt like my veins were filled with light. Twenty five years later, I can still pick up that trilogy and feel the same way. What was amazing to me about the original cover art for all three books, painted by Martin Springett, was that they seemed to be one with the feel and soul of the books. The reason I was struck by that first cover in the book store was that it felt exactly like what was inside the book — and since what was inside the book affected me so deeply, that cover inevitably affected me too. Eventually, because of that cover snagging my eye, I got introduced by Guy Kay to the eccentric writing of Robert Graves. And for the first time in my life, I found out about Celtic mythology, which I love madly. 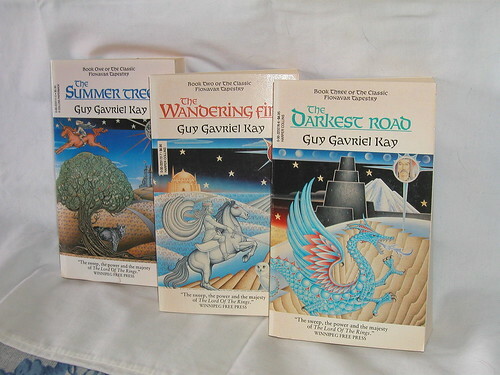 So I owe a lot to Guy Gavriel Kay and that first book, and to Martin Springett for being able to take the spirit of all three books and paint them, for the covers. I’ve been, once, to Martin Springett’s house, and seen the huge originals of those covers hanging on his walls. And I’ve got my own posters of all of them too. This all came to mind today because I saw a notice that Guy’s latest book, Under Heaven, will be published in April. And that led me to this little “The Summer Tree 25th Anniversary” blurb on Guy’s website, from last year. You can see him and Martin together, with the very first painting, the one that caught my eye that very first day on that original book cover. Much of my reading and study history in the past twenty five years has been because of these two. I never forget this. Phyl, that’s lovely! What a beautiful story. My brother and I both read and adored these books too. I can’t bring myself to read them again, because they were so beautiful it hurt and I don’t think my sinuses will take another weeping like I did at the end. I’m really excited for Under Heaven and also very pleased because Kay is coming to Waterloo in May — and my brother and I are planning to go see him. Love these books and his writing style. He has such a lyrical quality to his work. What a wonderful post! Fionavar is just such a creative twist on the arthurian story. I confess that I glommed onto a WHOLE BUNCH of GGK all at once so no one story or story set stands out that clearly for me, but he is really just a master at creating almost-familiar worlds and making you want to go live there. GGK is also, I believe, my introduction into the world of speculative fiction. I remember being shocked when suddenly we got Arthur and Guinevere in the second story, because I had never been aware of the deep Celtic roots of the Arthurian story. (I hadn’t been aware of Celtic mythology at all until Guy told me it was the basis of the Fionavar world.) So the first time around, I found it a bit jarring. But once I became familiar with Celtic myth (I read it like a madwoman those first few months), I just loved this new (for me) understanding of the Arthurian story. This was a resolution to it that I had never imagined in my wildest dreams. And as a side benefit, this was what spurred my own interest in the myths of the Goddess and the Divine Twins, or the sacred triangle, sometimes with one of the male elements divine and the other human. I really got fascinated about why it shows up in myths so often. That is a lovely story. Ironically, I haven’t read any of these books. Where in the world will I find the time? I guess I’ll have to make some. Yes, I really liked the blend of arthurian and northern european mythology. I was already a huge fan of Arthurian and celtic tales when I found GGK. Thanks so much for your very kind words on the covers for Fionavar. I am amazed that they still resonate. Do check out the lovely 20th anniversary U K Harper Collins set in paperback. I have created a decorative map to accompany Under Heaven, plus some music. It’s a brilliant book, very inspiring. Do take a look at Guy’s site or mine. Aw gee, thanks so much for dropping in! I’m really looking forward to the new book, and now I’ll be sure to listen to the music too.